We can’t help but be in awe of baby sea turtles. These small-but-mighty creatures, born on tropical beaches around the globe, endure a marathon fraught with danger –– in their first few steps of life alone. Those first few steps? Crawling from their beach nest to the sea. But let’s back up to how they got there in the first place. After laying her clutch of eggs, the adult female sea turtle returns to the sea leaving them to develop alone. When it’s time to hatch, babies use a temporary tooth called a caruncle to chip out of their shells. Digging out may take several days, even with a unified effort among hatchlings. The turtles stay in their nest until conditions are perfect. To them, perfect means nighttime when most predators are asleep and the harsh sunlight won’t overheat them. Once nightfall cools the sand, the race is on. As a group, the turtles wiggle and climb, navigating with sight and touch. They can feel the slope of the beach toward the water or see the natural light radiating from the ocean’s horizon. The bright, white sea foam on waves also serves as a guide in their short but challenging journey from nest to water. 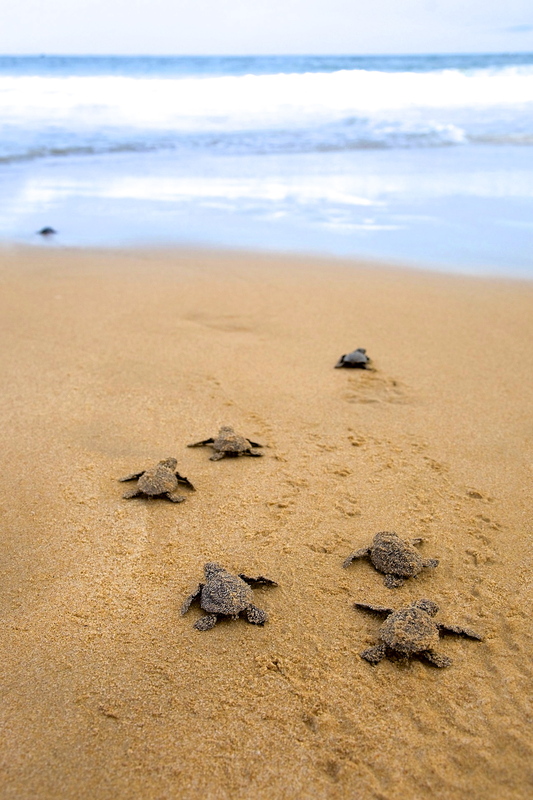 Unfortunately, baby sea turtles face daunting risks. Lights from the shore confuse them into crawling off course. If they don’t make it to the sea quickly, they risk dehydration or attack by predators. The risks are so high, in fact, that only about one in 1,000 baby turtles survives to adulthood. A few fast turtle facts: baby sea turtles vary in size amongst species but a baby leatherback (the largest of all sea turtles) is about two inches in length; incubation lasts about 60 days, depending on the sand temperatures; once in the ocean, baby turtles will swim for several miles to where they catch currents that will carry them onward for years, to tropical and subtropical regions around the globe.